Born May 11, 1904 in Figueres, Spain. 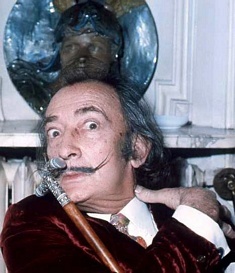 Dali was a skilled draughtsman who became world famous for his surrealist paintings, bizarre lifestyle and eccentric behavior. He is perhaps most known for being the author of "The Persistence of Memory" which he completed in 1931. He died on January 23, 1989 due to heart failure in his home town.